This prayer station exercises our creativity to “show” the power of prayer in a high impact way. Position the two tables like a T. The bottom of the T is the back of the prayer station. Cover the display tables with paper (tape the paper cover to the underside of the table). Arrange the dark & light colored tiles, ink pens, and instructions on the table which participants will gather around. Lay the board on the end of the table that forms the bottom of the T with plenty of room to work around the board. Tape, glue, paste, and paper towels can be placed under the table by the foam board. The collection container can be positioned at the opposite end of the table from the board. 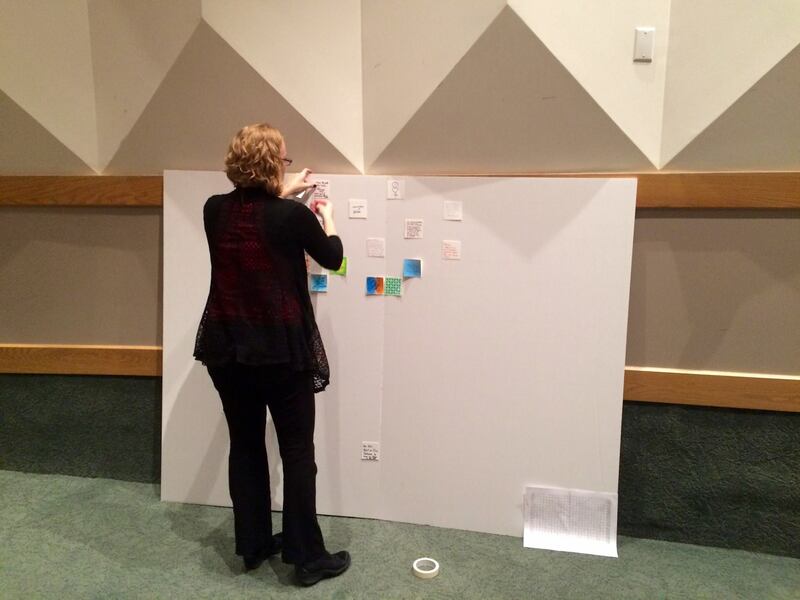 Participants will complete the tiles and place them in the collection container. 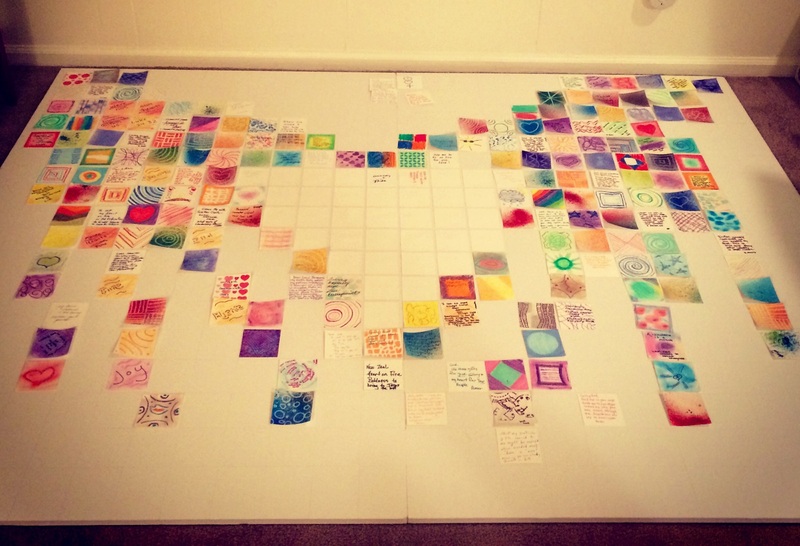 The prayer station volunteer will take the completed tiles and arrange them to create the mosaic pictured above. Select one decorated tile, one white tile, and a colored pen. We gather today with a desire to give, a call to share our God given gifts, and a heart of service and mission. Take a moment and think of all the talents and resources that God has blessed you with. On your decorated tile, use one of the colored ink pens to write down a few of those talents, gifts and resources that you can share. We are gathered to learn new skills and discover different ways to reach the world with the gospel. As our hearts burn within us, write a short prayer on your white tile asking for God’s guidance in mission and express what you hope to gain from this week’s gathering. Once you have completed your tiles please deposit them in the container provided. We clasp our hands together in prayer, prayers that will change the world. We join hands to reach around the world with the unending love of Christ Jesus. Once your personal prayers are said and your tiles contributed, they will be used for a mosaic that displays a bigger picture of how God is using us to reach out to his children of the world.